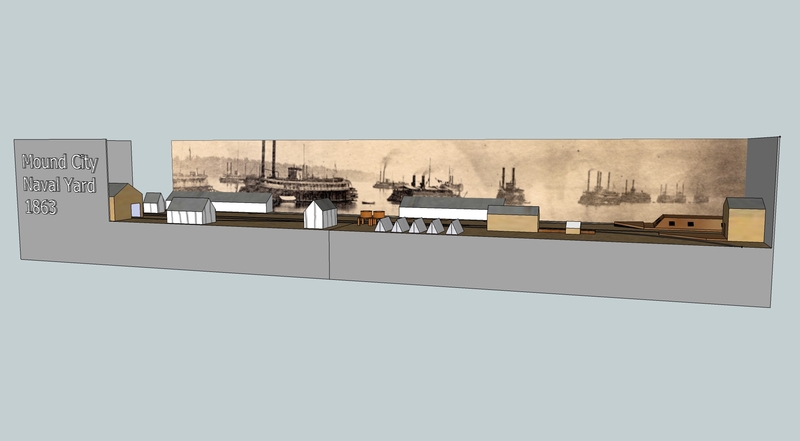 Mound City 1862 is a display layout I am building that is intended to travel and be shown much like is done in the UK and Europe. This will be my first true display layout. I have exhibited with the Free-mo organization at the National Train Show in 2012 and enjoyed it very much. I actually enjoyed talking with the crowds more than running the trains. My goal is to have it ready for the National Show in Cleveland in 2014. Mound City Naval Station. The building on the left might be the original railroad depot. The large brick building just peaking from behind the trees and other building could be the hospital. Mound City IL is located at bottom of the state and other than Cairo, IL is the most southern point in the state. 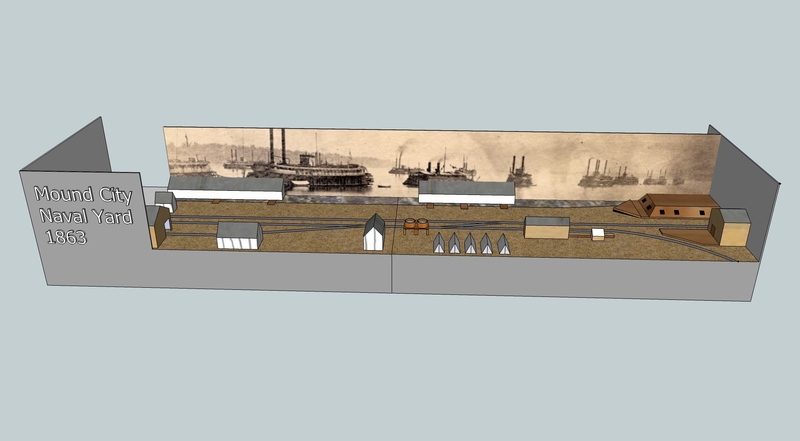 In 1861 at the start of the Civil War the city was fortified and the marine ways along with the railroad depot, warehouses and river frontage were handed over to the US Army. Several Ironclads, Rams and various other elements of the Brown Water Fleet were erected here. The most famous being three of the Eads Ironclads, U.S.S. Cairo, U.S.S. Cincinnati and the U.S.S. Mound City. Mound City and Cairo were very strategic locations as they would become the jump off points for the first major western battles of the American Civil War. A large warehouse in Mound City was converted into a hospital and served the wounded from battles like Shiloh. With the marine ways the locations primary function was the service and fitting-out of the large river fleet which was required to patrol the Mississippi and Ohio Rivers. The railroad played a key part to all of this. The Mound City Railroad was built by private interests prior to the civil war to connect Mound City with the Illinois Central main line at Mounds IL some six miles away. The railroad serviced the hospital and the Naval station with regular trains of supplies and fresh troops from Chicago and other points north. 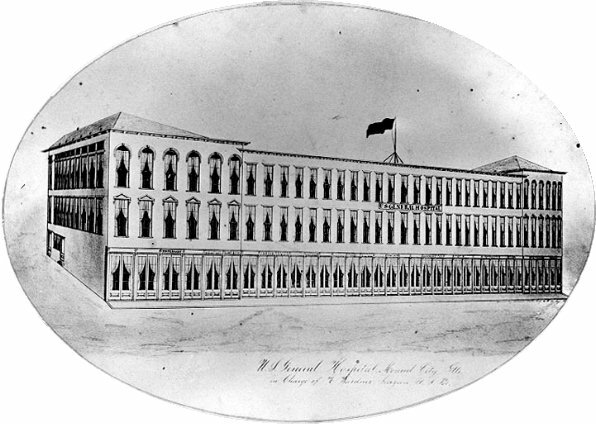 In 1862 the Maine Ways, hospital and other facilities were officially transferred from the Army to the Navy. At this time many Naval operations were relocated from Cairo, and St. Louis to Mound City. This makes the fall of 1862 a very busy time for Mound City and the basis for the display. There are not many images or maps of Mound City from the 1860’s. As a result research and creating an accurate representation has been difficult. The only map of the area (which is known to be simplified) shows one main line splitting into three stub tracks. One servicing the hospital and the other two servicing and the old station and other buildings. 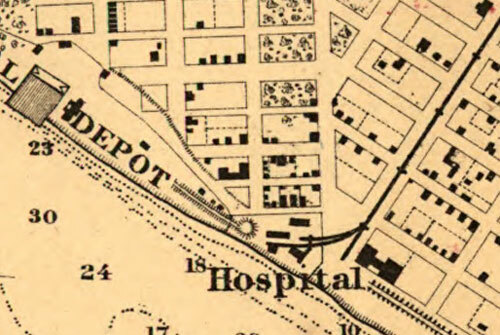 We also know that a second depot was erected in 1861 for the general public since the army took possession of the original depot near the river. It is believed that the small depot at Mound City today is the one built in 1861. This layout is small at only 8′ x 2′ and 16″ of that will be for a traversor to bring new equipment into the scene. The layout will come apart into two 4 foot sections. The legs are designed to fold up into the bottom of the modules. This is something I learned from building Free-mo modules. I prefer designs that are self contained to make moving and storage simple. The following illustrations were concept drawings I did before I found the map of the city showing the track arrangement. Even so, it shows my intentions on how the finished layout will look. Click the image for a larger view. I just started the layout in September 2012 and as of this writing I have the frame 90% completed. I just need to finish the fascia and install the lighting. The module is constructed very similar to the $100 Dollar Module Concept with some changes like folding legs and some different material choices. When completed the layout will have several mini scenes including treating the wounded at the hospital, a soldier encampment, the supply warehouse and an artillery battery. As the layout progresses I will continue to provide updates. The next step is the lighting which I intend on having auto dim for nighttime scenes and maybe even simulate twilight. 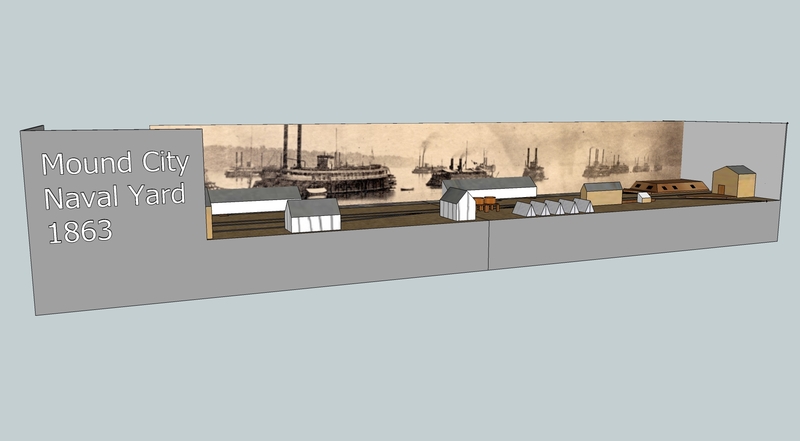 Inspiration for this layout came from the Yahoo Small Layout Design Group and the American Civil War Railroad Historical Society (ACWRRHS). Here are a few links to other peoples Civil War Modeling Efforts. Looks good. Is this in HO scale? The coved sky board is very interesting. Thank you. Yes, this will be HO scale. The skyboard is tempered hard board be the $100 module style. I am not familiar with the $100 module style. Is that docuemnted on the SLD Yahoo Group? Wow. I like the skyboard idea, but 35 – 40 KG for a 4 ft module seems really heavy. I plan to use a 1×3 lumber (ripped plywood) with 1/4 inch plywood skin. Then foam for terrain elevation. The road bed will be 1/8 inch aspen plywood. A suspect a 4 ft module will me about 10 pounds. I once built a small layout using foam core for the terrain surface. It was on the cover of MRP about 10 years ago. When I ballasted it warped and became unusable. I threw it away. I agree, his design is too heavy but the technique works in many other materials. As I said in my article I made different material choices and stayed away from particle board except for the sky board because of smoothness and it’s ability to bend to the correct shape. I use thinner materials and I put a lot of holes in my frames to lighten them. My photo does not show it but I am adding holes to the sky board supports to lighten them up. I learned this from Model Airplane Modeling. For very light and stiff modular layout frame designs you need to see the professors presentation at http://staff.fairlightau.com/johnd/M-R-H/Prof_Klyzlr_Foamcore_Modules_s.pdf. I will be using some of these techniques on future layouts. The trick with the foam core is to construct it in a self-supporting method and I would seal it prior to any “wet” scenery methods. The professor’s methods go beyond that moving to ladder frame construction with self alignment tabs and aluminium channel to ensure stiffness. Glad to hear there is interest from the area. Displaying it in the area is possible once it is completed and run through the paces a few times. It was very difficult to choose between Cairo and Mound City. Both have a wealth of modeling opportunity for the era. I’ve studied the Mound City Naval Station through various sources in the National Archives and have several things I could email to you. I finally got the post a comment thing to work. The items I have include a scale drawing of the entire naval station circa 1870. I also have a drawn to scale map published by the Congress during a study of various inland naval stations and marine ways. And I’ve got a couple of photographs. Where did you get the topmost image of the naval station? How do you know it is Mound City? I didn’t see a source for the image. I would love to have any additional information on Mound City. The image at the top came from http://www.picturehistory.com/product/id/10602. I do not know where they got it from. It appears to be correct and is from the opposite angle from the one published in “The photographic history of the Civil War”. The larger building in the background resembles the shape and location of the hospital.